«©NCSX» Join old and new Zoids characters in a new adventure game where drivers hop on Zoids mechs and battle incumbent forces. 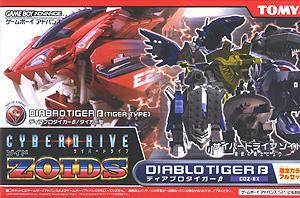 The limited edition of Cyber Drive Zoids includes a Diablo Tiger Type-B action figure, a remote control device and the Cyber Drive Zoids game. The Diablo Tiger may be controlled by a GBA and the included remote-controller transmitter which plugs into the accessory port of the Gameboy Advance or Gameboy Advance SP.